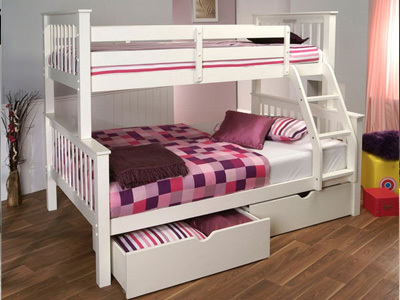 With a single bed on the top bunk and a double bed on the bottom, these family friendly bunk beds are ideal when space it at a premium. Choose from robust metal or wood finishes. Bundle deal mattresses available with a 20% discount. 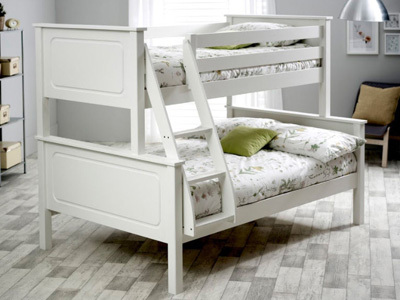 Triple sleeper bunks or 3 sleepers are very similar to bunk beds but have the advantage of a double sleeping area on the bottom bunk. An ideal setup for families sharing and an excellent space saving solution for rooms that may not have the floor space to house this amount of sleeping area. 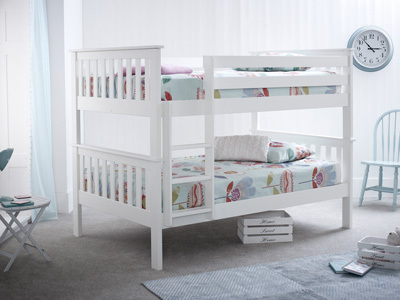 Many of the triple bunks allow the top single bed to be separated so it can be used independently. This multi-use option allows for several different setups of this bed and means it can be used in separate rooms if required. Often when children grow up they want to move from a single to a double bed, but, unfortunately if you don’t have enough rooms in your home this is not usually possible. 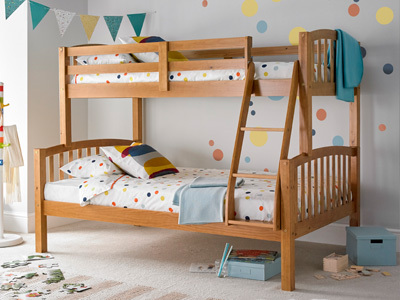 Well, with a triple bunk bed the combination of one single bed and one double bed allows the elder sibling with more room to stretch out. Most triple beds have a double at the bottom, but there are some exceptions. 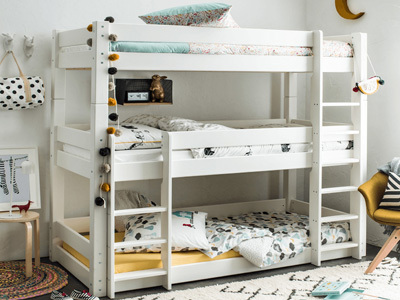 Some triple bunk beds, like the Stompa Classic Kids White Bunk Bed contains a hidden bed placed underneath the bottom bunk. 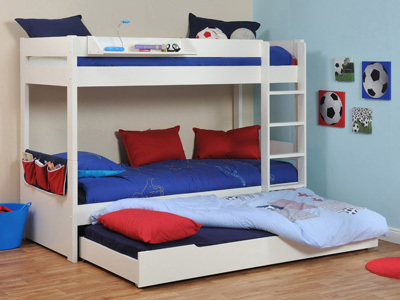 This bed can be pulled out for sleepovers which sorts the hassle out when it comes to who’s sleeping where. 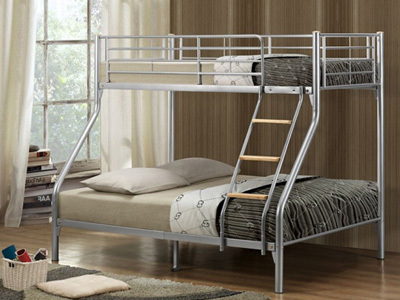 Bunk beds either come in wood or metal which is great if you are looking to style a traditional or a contemporary bedroom. 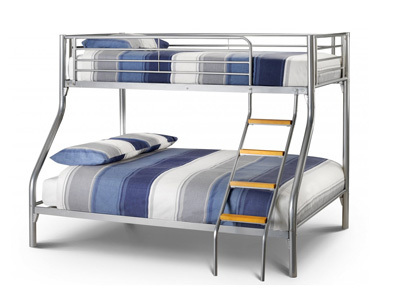 Metal bunk beds are generally stronger. 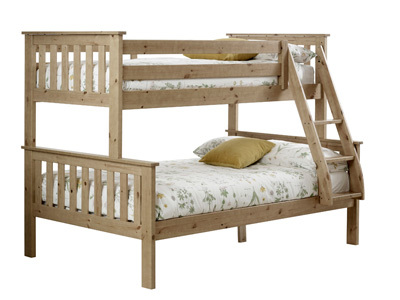 Take, for example, the Birlea Nexus Triple Bunk Bed. 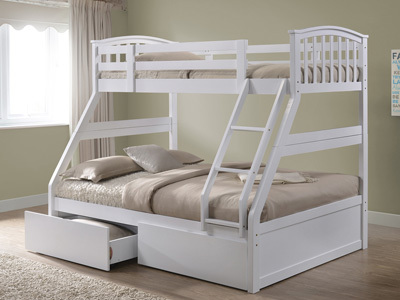 This sturdy piece comes with a fixed ladder at a tilt, making the climb up to the top bed easier. 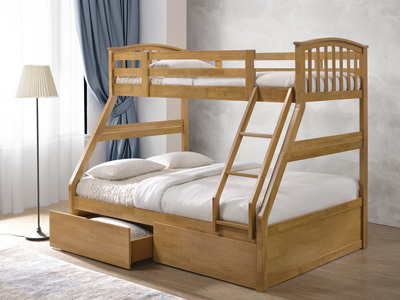 Bedstars triple bunks are constructed of metal or wood and conform to strict safety regulations. 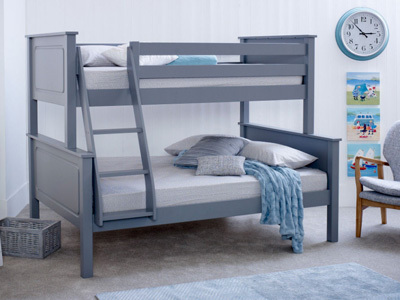 The top bunk will have an extra safety rail running around the perimeter of the bed due to its height off the ground and the ladder steps will incorporate anti slip pads to avoid accidents. There are many options for colour and design giving an excellent choice to find a perfect fit for your bedroom design. 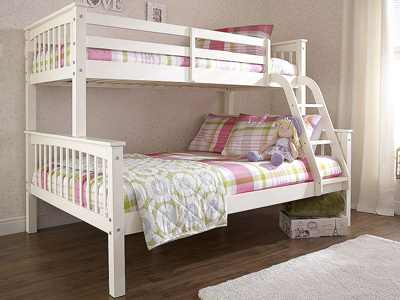 Many of our 3 sleeper bunks are in stock and available for next day delivery. 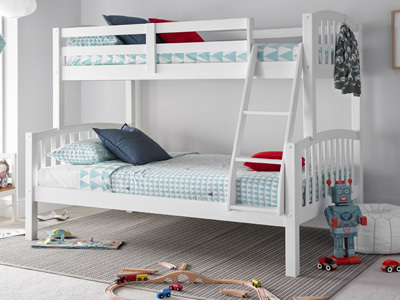 Treat your children to an exciting new bedframe at Bedstar is home to the best family beds.